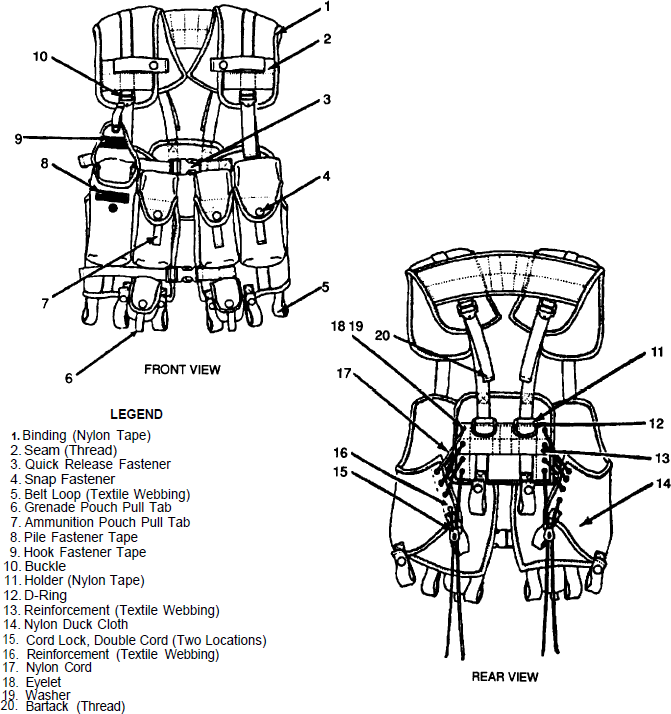 The vest consists of the suspenders, a left, right and back panel that are connected with adjustable drawcords in a corset lacing system secured by cord locks. The vest weighs 1.8 pounds empty. It provides space for six 30 round magazines in four permanently attached ammunition pockets (two each in the outside pockets, and one each in the inside pockets) and two fragmentation grenades in two grenade pockets. In the mid-1990s, the ITLBV was redesigned due to problems with ventilation and redesignated as Enhanced Tactical Load Bearing Vest (ETLBV) having slanted ammunition pockets attached on mesh panels.